Cables are arguably one of the worst inventions in human history. I mean, of course, they allow us to do great things, but they’re almost always the unwanted byproduct that we have to put up with to get those great things. The tangled mess of copper and insulation that many desks know all too well and the classic rat’s nest at the back of every gaming PC would have never existed had Tesla gotten his way years ago. That being said, wireless technology is at a pretty impressive level now. As you would expect, there is no shortage of wireless keyboards to choose from. To help you choose from the plethora of options we rounded up our top picks and reviewed each one to help you find the best wireless keyboard for your needs. If you’re already a keyboard enthusiast then you know that mechanical keyboards are the only way to go for many people. And when it comes to mechanical keyboard switches, nobody carries a more respected name than Cherry. If you’re looking for a wireless keyboard for PC with premium mechanical switches, then the K63 from Corsair is a great choice. The K63 uses Cherry MX red switches and has a number of other features that make it the best wireless gaming keyboard on our list. For starters, there is a USB passthrough port that lets you plug in a mouse or headphones. Also, the keys of the wireless backlit keyboard can be programmed in Corsair’s iCUE software to execute custom macros. Your macros can then be saved to the 8MB of onboard storage and brought with you for easy gaming on the go. What’s more is that this is one of the most durable wireless keyboards on the market thanks to its aircraft-grade anodized aluminum frame. When it comes to connectivity, the K63 leaves you with no shortage of options. You can either use the USB dongle to connect to devices through a 2.4GHz connection that sports a 1ms latency time or use the keyboard’s Bluetooth to connect with Android or Windows devices. The rechargeable battery is the only real aspect of the K63 that leaves a bit to be desired with a battery life of about 25 hours with the backlight on low, and a micro USB to charge. That being said, its 75 hour, non-backlight usage is still pretty poor compared to the next keyboard that has an 18 month battery life! While Cherry is by far the most respected name when it comes to mechanical keyswitches, there are plenty of other contenders on the market. One company that actually makes its own switches for its mechanical keyboards is Logitech with its well received Romer-G switches. These switches are used in the Logitech G613 and give it a silent but precise keystroke. 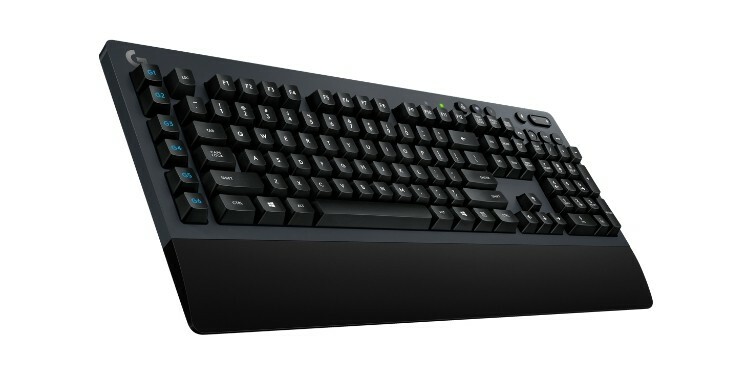 On top of the nice key switches, Logitech has added six dedicated macro keys along the left side of the keyboard that are easy to reach, easy to program, and make this hands down the best Bluetooth keyboard for those who like using macros either in their work or while gaming. 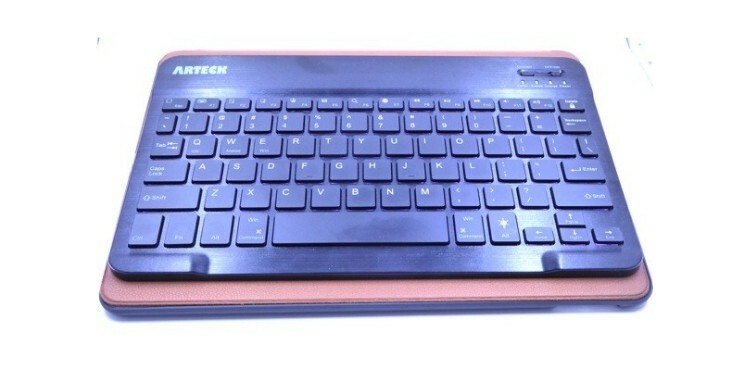 This Logitech Bluetooth keyboard can connect with a wide variety of devices including iPhones, Windows computers, Androids, Macs, and even Chrome OS systems. Much like the Corsair K63 we looked at, the G613 can also be paired with an included dongle rather than Bluetooth to offer a lightning fast 1ms latency for better gaming performance. While the macros and wide variety of connection options are nice, there are a few things that hold the G613 back from true greatness as a gaming keyboard. For one, rechargeable batteries would have been nice to see, even if the two included double As will last for 18 months. Secondly, backlighting is essential for a good gaming keyboard, since a lot of gaming (as much as we hate to admit it) happens in dark rooms. Repetitive strain injuries are no joke and can be seriously painful or even require time off from work. If aching tendons is a feeling that you are all too familiar with, it might be time to consider purchasing a more ergonomic keyboard than the one you currently use, such as the Microsoft Sculpt. 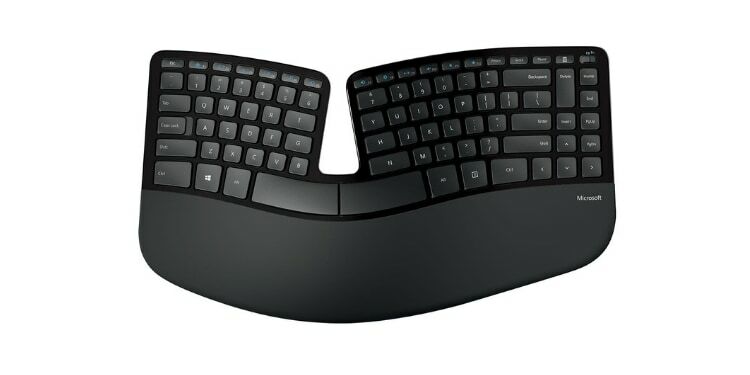 This keyboard features a layout that will be unfamiliar to many people with its strange curvature and split in the middle. The curvature helps reduce pronation, which is the movement of rotating your hands so that your palms are facing towards the floor. The split in the middle allows the keys to be angled slightly towards each other, which reduces wrist flexion. These two undesirable hand postures are what result in a majority of cases of repetitive strain injury or pain from typing. In addition to the ergonomic design of the keyboard, the Microsoft Sculpt also comes with a special ergonomic mouse making this the best wireless keyboard and mouse for those seeking relief from typing pain. The mouse included with the Sculpt will also appear strange to many people at first with its very high thumb notch and large almost spherical shape. Again, this shape and design are made to reduce pronation and put your hand in a more natural “hand shake” posture. Logitech boasts a product line full of niche products designed to precisely the suit the needs of a niche market. This can make the search for the right keyboard feel almost overwhelming at times, but you can always rest assured that Logitech has a keyboard tailored to your exact use case. For example, let’s say that you’re someone often on the go who needs to get work done on your phone, tablet, and laptop. You prefer typing with a keyboard while working on your phone or tablet, but hate having to haul around a bunch of flimsy keyboards for mobile devices. Well, if this sounds anything like you then hands down the best Logitech keyboard for your needs is the K780. This keyboard is designed to be synced to multiple devices ranging from PCs to tablets, or pretty much anything that has either a USB port of Bluetooth. You can then switch between up to three devices with a single button. At the top of this keyboard above the number row is an integrated phone and tablet stand. A thin groove with a lip on one side lets you place your devices right on the keyboard and type on them in an almost laptop-esque configuration. Yet again, it would have been preffered to see rechargeable batteries on this keyboard, but instead AAA batteries are used (what is this, 2002?). Also yet again they last for a very long time, 24 months in fact, but rechargeable batteries are still often considered more reliable in the long term and simply more convenient overall. 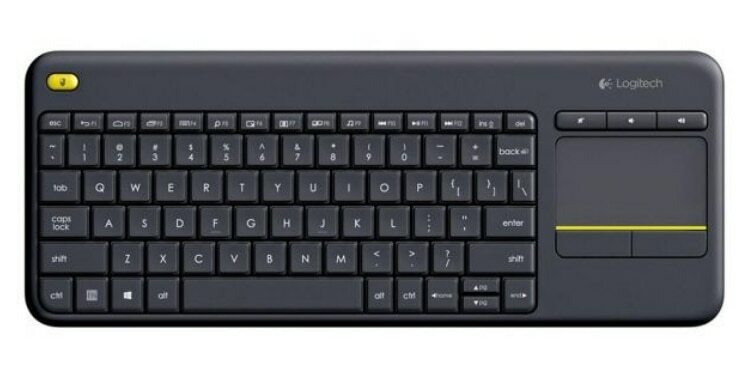 Next on our list is another Logitech keyboard that fits the narrative we discussed earlier of “if you need it, Logitech probably makes it”. This time, however, it’s a keyboard for those who have a media center, or simply like plugging in their laptop to the TV to watch Netflix. If this is you, then you know the feeling of having to walk all the way to the keyboard on the computer to change the show or pick the next video. This also has its own dedicated trackpad, so if you want a simple way to control your computer from the couch without having to get up, then the K400 plus is arguably the best computer keyboard for you. This wireless keyboard is easy to set up. All you have to do is plug in the USB dongle and the keyboard will automatically pair with whatever device the dongle is plugged into. It uses a 2.4GHz connection and does not have Bluetooth, meaning you won’t be able to sync this particular keyboard with your phone. Once paired with your computer the keyboard makes Netflix, YouTube, or Hulu browsing super easy and comfortable with a trackpad to the right side of the keyboard, some volume buttons above that, and a full sized keyboard layout on the left. This slim and simple keyboard looks great in practically any home theater setup and adds tons of functionality. Never again will you have to get out from under the blanket to tell Netflix you’re still watching. 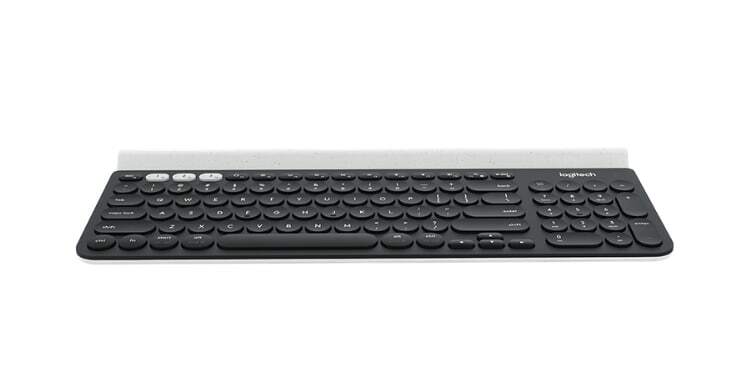 If you’re looking for an affordable wireless keyboard, then look no further than the Arteck HB030B. Despite it’s very low price, this keyboard actually flaunts a few features that most of the other keyboards we looked at don’t have. For starters, there is a rechargeable battery onboard that can be replenished using a standard micro-USB plug. Not only is the battery rechargeable, but once charged it holds enough power for roughly 6 months of use. 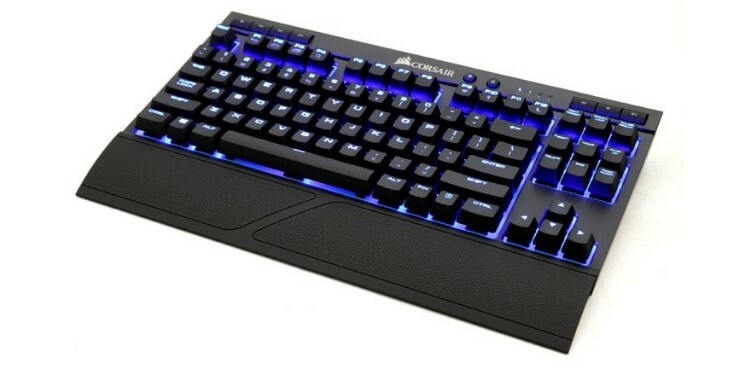 This keyboard also features RGB backlighting that can be set to one of seven different colors. Again, this is more than other keyboards on this list can claim. Using Bluetooth this humble giant can connect to practically any device including phones, tablets, and laptops. With all that said, there are of course some weak points here as well. Despite the versatility of Bluetooth, not having a dongle at all will lose this keyboard some points. Many laptops and especially desktops don’t have a Bluetooth receiver built in meaning this keyboard cannot be used. Additionally, a lot of the polish you would find on slightly more refined products are lacking. There is no indication as to when the battery is about to die, and the connection is not the strongest. Don’t expect to be more than a few feet from your device while using this keyboard. Keyboards are actually surprisingly complex devices when you get into the nitty gritty details. There are tons of moving components that make up the keys themselves and a variety of features they can have. To help arm you with the knowledge you need to pick the best possible wireless keyboard we’re going to discuss several of the things to look out for. USB Dongle. USB dongles use a 2.4GHz signal. This signal is low latency and reliable, which makes it better for things like gaming, but it cannot generally be used with a wide variety of devices, ie phones/tablets. Bluetooth. Other keyboards use the standardized Bluetooth frequency to connect with devices. This means that these keyboards can connect to things like phones and tablets, but this connection is slower and therefore less suited to gaming. Another thing to be aware of when shopping for wireless keyboards is what kind of batteries they use and how long the battery life is. While most people are ultimately ambivalent to the matter, generally rechargeable batteries are considered superior to typical replaceable batteries. It is better for the environment and creates less waste and is often cheaper and more convenient in the long run. That being said, only two of the six keyboards we looked at have rechargeable batteries, those being the Corsair K63 and the Arteck. The rest use either AA or AAA batteries. That being said, the two keyboards that use rechargeable batteries also happen to be the two with the worst battery life. The Arteck keyboard can run for about 6 months on a full charge while the Corsair K63 can be toast in as little as 25 hours. The keyboards on our list that use a pair of replaceable batteries only need to have their batteries replaced once every 18 months in most cases, with some lasting as long as two years. Ultimately, it is up to you to decide whether you want to be plugging in your keyboard to charge more frequently, or running to the store to get batteries every year and a half. Key switches are one of the most fundamental parts of any keyboard. Key switches are the actual piece of hardware that detects when a key has been pressed. Most keyboards now, including four on our list, use some form of rubber dome key switches. These are silent and inexpensive but can generally have a “mushy” or inconsistent feel. If you’re looking for a premium feel when you press your keys then a mechanical keyboard is undoubtedly what you’re after. The Corsair K63 keyboard uses Cherry MX Red switches from the most renowned switch maker in the world. The Logitech G613 on the other hand uses a custom proprietary mechanical switch from Logitech called the Romer-G. Either of these keyboards will offer a much more consistent and satisfying feeling when typing or gaming compared to the keyboards on our list that do not offer mechanical switches.